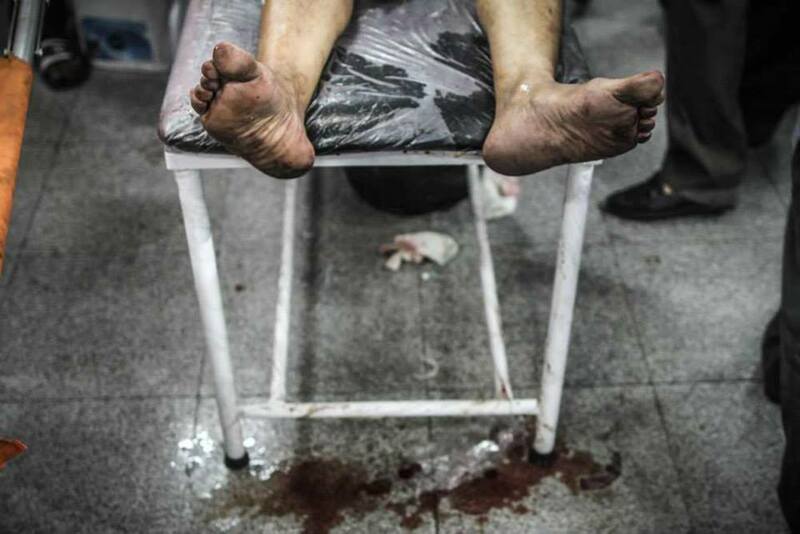 It was inside the hospital adjacent to the Rabea al-Adaweya mosque that I first began to fathom the scale of the killing. In the halls, in every corner, on every floor, the dead and wounded were sprawled; and there was an incessant flow of more being carried inside. The stairs were slippery with blood. It was stiflingly hot. All the windows had been shut to keep the tear gas out and the air, pungent with chemicals and sweat, hung heavy. The cacophony of shouting and moaning and sobbing rose above the mechanical crackle of the machine guns doing their work outside. Mass death assaults all the senses at once. 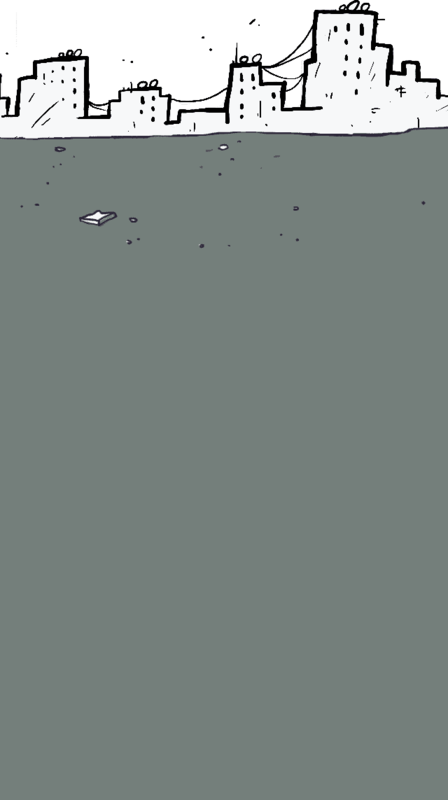 I came across an elderly woman sitting on the floor, her head wrapped in bloodied bandages, her hands drooped to the ground, wrinkled palms facing upward. She was far too old to be in this place. This is where the young die. She looked exhausted, staring into the mid-distance, her eyes vacant, her mouth slightly open. I felt I could see the life seeping out of her. A man was trying to talk to her, to get a name or a phone number, someone to call, but she just stared straight ahead, gazing at something only she could see. A little while later I saw her again. She had crumpled awkwardly to the side, her head on the floor, the commotion around her continuing without pause. She had died unnoticed. I cannot forget her. How to feel nauseous and numb and alive at the same time? How to grasp what was happening around me? And I still hadn’t seen the rooms in the basement. I didn’t yet know that I had entered a charnel house. At the foot of the stairs, a man standing in front of a door was sifting through a thick stack of national ID cards. I asked him whom they belong to. The martyrs, he told me. Show me, I said. He looked at me silently for a few moments then opened the door and stepped aside. The room was large and connected to another room through an open doorway in the back. Both were completely filled with bodies. They were all men, mostly young. They were packed so closely together on the floor it was difficult to walk inside. It takes at least several hours, maybe a day, for death to begin its work disfiguring the body. It stiffens and bloats and contorts and grays. The body is turned into a carcass, an empty shell with no soul. But the newly dead are still warm, still tender, still colored with the afterglow of life. They look asleep. That is what they looked like in this room. Dozens of young men asleep on a blood-soaked floor, their mouths held shut by a strip of white cloth tied around the head and chin, their hands bound together across their stomachs, all nestled together in an unmoving slumber. I found several more rooms overflowing with the dead. I discovered other hallways with bodies wrapped in plastic bags stacked in rows. I saw corpses burned beyond recognition. I kept trying to keep the count right, to be accurate, to not miss one. I didn’t yet know that there were far more than I had ever imagined. The constant sounds of the attack did not leave a moment for relief. Nothing was louder: not the voice of a person suffering, not the voice of one’s heart beating hard out of fear, not the voice of souls running for their lives and out of breath. There was only gunfire. And it was ongoing, rhythmic and pervasive. It became the city’s soundscape: For those inside, the whole city became Rabea. The hospital was designed for the dead and people injured by live ammunition. Anyone injured by birdshot was not permitted entry, as they were not a treatment priority amid the incessant gunfire. Therefore, they lingered in pain, unable to move, on the stairs of the hospital or on any stretch of pavement they could find within the confines of the shrinking encampment. They embodied some sort of purgatory in a battlefield reduced to a fault line between life and death. At this point, the sit-in, which had hours before broken out of the border that had defined its existence for a month and half to expand into surrounding streets, shrank back to hug the hospital and the stairs leading into it. Defeat was pronounced in this diminution, but their adversary still had one last blow of violence to dispense. The sound of gunfire intensified, and the hospital came under attack. The end of the battle was approaching and a choice presented itself: either stay to witness it and risk becoming engulfed, or leave it behind and risk losing part of the impossible yet key memory. I chose the latter. I ran out of the hospital in my most personal struggle for life. Moments before, I had barely been able to tolerate seconds in the hospital room where dead bodies were piling up. I wondered what one can do as a witness to death. I still do. 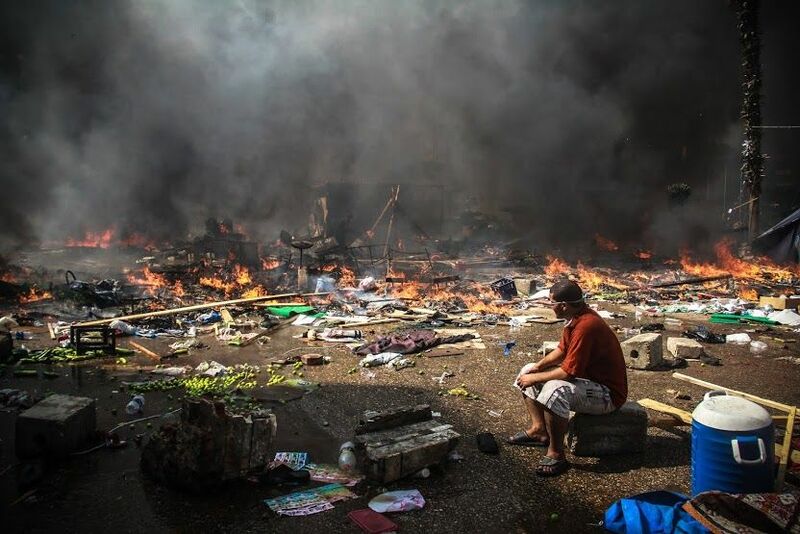 Four years after the now infamous scenes of bodies piled high, of the unending racket of gunfire and sirens, I often recall the last hours of resistance in Rabea, before security forces descended on the camp, bringing the sit-in to a bloody end. It would be one more day day before the flame of Rabea would go out — but defeat had already set in. The microphones that had encouraged people to hold their ground had fallen silent. Bodies filled the hallways. People had realized the futility of it all. A man sat amid burning tents in the aftermath. Behind him, there was a massive wall of smoke caused by a barrage of tear gas canisters. Shadows of armored vehicles and lines of soldiers loomed on the other side, bringing with them a cruel inevitability. On the floor beside him was a blue water cooler, emptied in a feeble attempt to contain the massive fire that had spread across the camp, which had existed for 40 days. Lemons and cucumbers were thrown on the floor, dotting a puddle — a reminder of a life that had tried to endure in a time of bloody panic. And there sat this lone man, the epitome of defeat in its most bitter and abandoned form. The day after the dispersal, I was standing by the doors of the Iman Mosque, near Rabea al-Adaweya Square, where some of the bodies had been taken. By the entrance, I became lost among the crowds of relatives who had gathered to read through the lists of names hung on the wall in an attempt to identify those who had been killed. One man held a phone to his ear. He was shouting at someone on the other side of the line: “Yes. Yes. I see her name here. Be strong. She is in heaven.” He was crying as he ran his finger down the paper. And then he stopped and stood still, before starting to cry again. He crashed against the gate and slid to the ground where he sat with both legs sprawled, submitting to gravity without putting up even the slightest resistance. I approached the man and he told me, in broken sentences, that he had been speaking to his sister, informing her that her daughter had been killed “for sure,” because he saw her name on the list. But, as he glossed over the rest of the sheet, he saw his son’s name. He did not even know his son had been injured, only coming to the square to confirm his niece’s death. I could not find the words to say to him, so I left him and entered the mosque. There, bodies were scattered on the ground, leaving no space to walk without stepping over them. They were shrouded with black plastic bags, under huge blocks of ice. The mosque had no ventilation. Families sat on the floor beside the bodies. 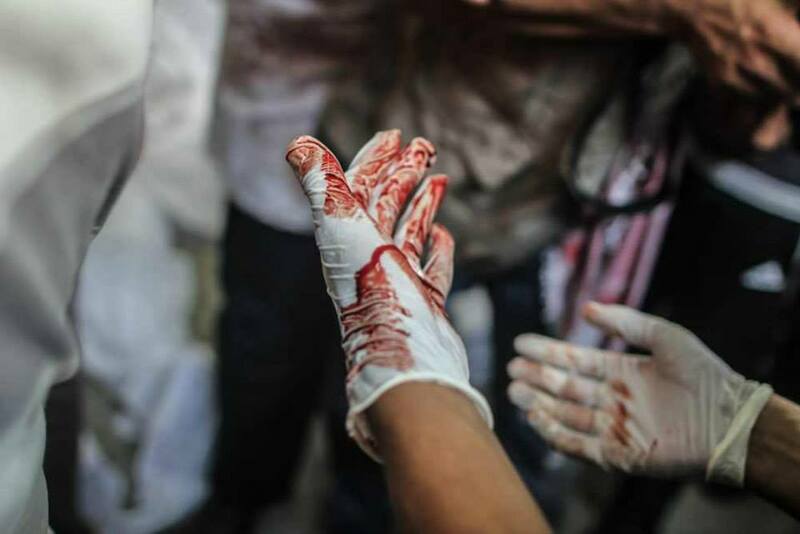 Doctors affiliated with the Muslim Brotherhood were counting the corpses. People had been taking coffins out of the mosque for burial since dawn. 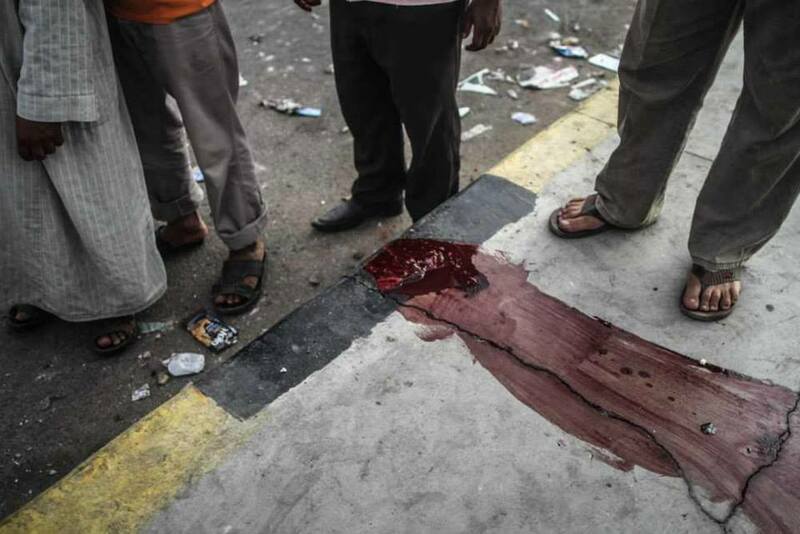 The Health Ministry issued a death count that differed from the numbers tallied by the Brotherhood in their statements. I had to count. I tried to tread on the edges of the shrouds to avoid stepping on the bodies but failed. A man suddenly removed the covering from a corpse. It was the body of a 16 year old, he said. It was completely charred. The ashes fell on my clothes. In one corner of the mosque, a woman in her late 50s sat motionless and with a fixed look on her face. She did not want to close her eyes after seeing her son for the last time. She turned her head toward his corpse. His shroud was covered with blood. She did not utter a single word and did not shed a single tear. I finished counting the bodies and came back to her, feeling the urge to say something but not knowing what. I stopped halfway through and thought, what do you say to a mother who has lost her son this way? I turned my back and left the mosque. I entered one person and came out another. Tamer Waguih | But the trauma of Rabea will never heal unless it is drawn out of the circles of polarization and negation. The famous yellow Rabea logo: What has it achieved? Mohamed Hamama | The Rabea logo was not birthed spontaneously; it was the work of a specialized team. 2 years later: Who is to blame for Rabea?